It’s the season opener in Melbourne and I’m learning the ropes in my McLaren MCL33. Alonso’s set some competitive times in FP2, and I want to impress the team by slicing a few tenths off. Before heading out, my engineer Jeff warns me to not get greedy with the curbing coming out of the fast S-bend that is Turn 12. It happens just as I start straightening out. The rear left tire just clips the rumble strip on the exit of the turn, pitching the car into a lurid slide at well over 120mph. I don’t save it, but luckily do keep the damage to a minimum, outside of a bruised ego. Trundling back to the pits, I repeat Jeff’s warning in my head, and it’s here, in the early moments of the game, that I realize what F1 2018 is doing. This is a racing franchise like few others, ensconcing you in the action by making you just one part of a massive team effort. 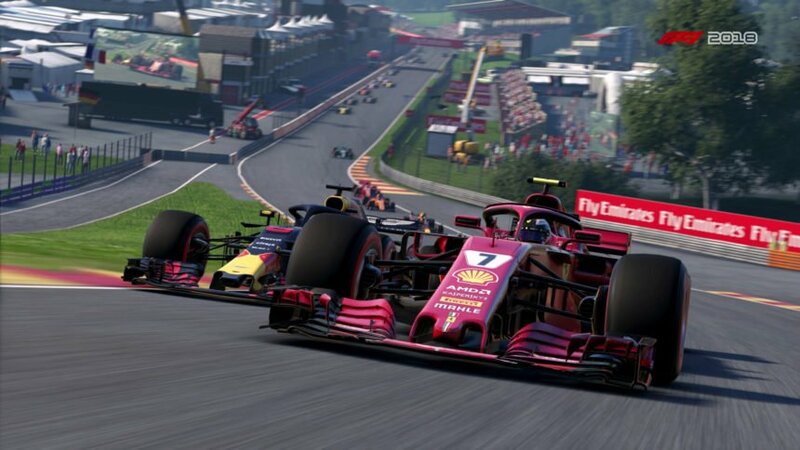 Its predecessor was a very good game, and thanks to careful evolution, F1 2018 might just be the best racing game you can buy this generation. 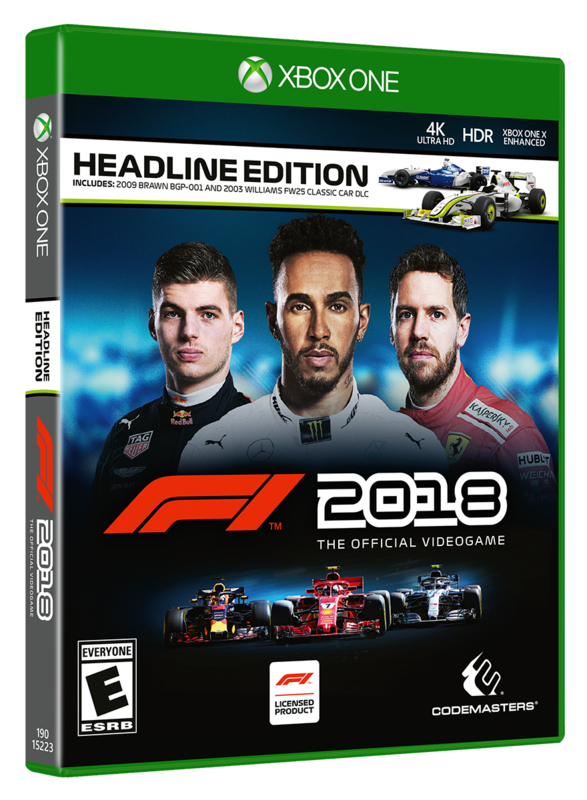 F1 2018 releases Friday, August 24, on PS4, XB1, and PC. 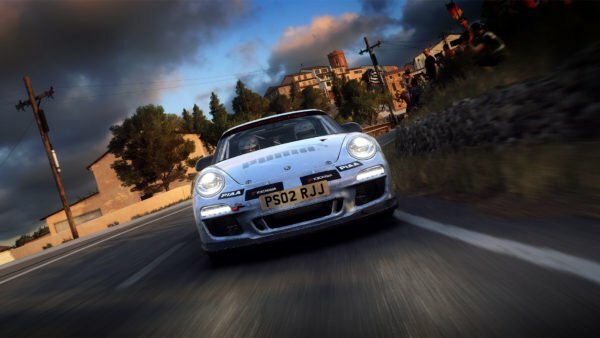 Codemasters provided a pre-release version of the game for review on Xbox. I played it on Xbox One X, with both a pad and the Fanatec CSL Elite PS4 wheel (with P1 Elite rim). Like F1 2017, this year’s game is a surprisingly large affair for an elite racing series featuring ten cars. As expected, the entire current lineup of drivers, cars, teams, and circuits are here, plus four short tracks. The dozen classic race cars from last year return, alongside eight new additions. 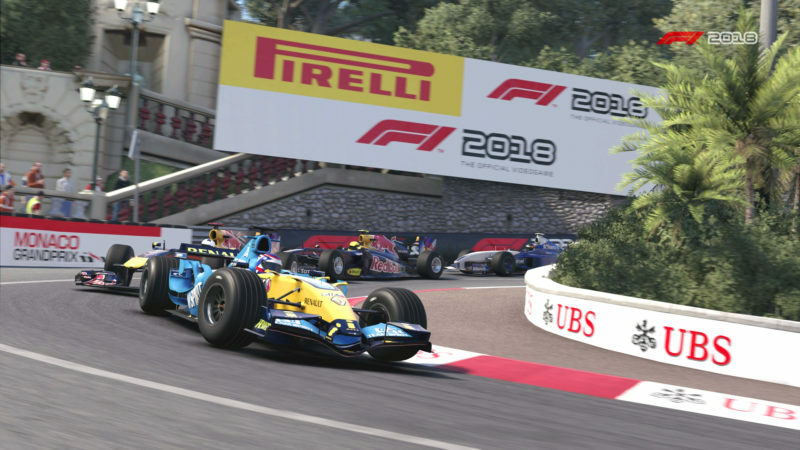 Two of these — the 2003 Williams FW25 and 2009 Brawn GP BGP-001 — are unique to the Headline Edition, though Codemasters has said they will be available later as standalone DLC. There’s a brace of game modes to satisfy anybody from casual to diehard. Grand Prix does what it says on the tin, letting you hop into a specific race weekend. From there, you can customize nearly every facet of the event. Cut down the practice or qualifying periods, turn on formation laps, set the race distance, crank up the AI difficulty; it’s all here. What’s more, you can add multiple races here to form your own championship — up to 25 in total, covering every track in the game. Speaking of, Championships are their own pre-baked series of races. You’ll find 20 here. The series vary in nature, covering the modern and classic eras, or focusing on wild weather. Alongside these, you’ll find the shorter classic-only Invitational Events, which pop up periodically in Career. Ah, Career. This is really the star of the show in F1 2018. Last year’s title already featured one of the best careers in the business, and ’18 moves the bar ever higher. Now you have Claire, a hungry reporter, close on your heels after most on-track performances. She asks simple enough questions, and your answers all have consequences. On their own, no single response will tank your standing with your team, but throw one R&D department under the bus enough times and you’ll find their morale correspondingly dire. That translates to higher prices on upgrades, plus increased failure rates. It’s an intriguing addition. Luckily, most answers have obvious positive consequences, so you can focus on bettering your team as a whole. Have a major off at the track, or rub tires with an opponent, and you’ll find yourself with only bad responses — which makes sense, really. Your answers can also feed into your reputation. Every driver is ranked on a scale between sportsmanship and showmanship. Some teams prefer the former, others — like Ferrari — the latter. Leaning into the desired character helps another new feature: contract negotiations. Every few races, you’ll be given the opportunity to set your terms with the team. Pick perks like increased resource points and your proposed contract value will shift upwards. Go too high and the team will reject your proposal; do it too many times and you’re stuck with the original offer. It all feeds into the feeling of an entire season being one big journey. You don’t win a championship simply be coming first at a single grand prix. 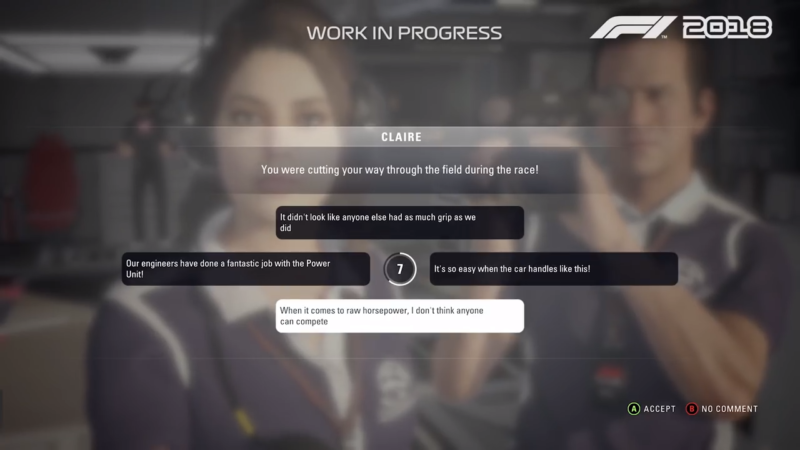 Luckily, F1 2018 doesn’t throw players into the deep-end without a helping hand. There are myriad tutorials and helpful prompts throughout the Career. The training programs are not only great ways to learn the tracks, but build up a veritable stock-pile of resource points. 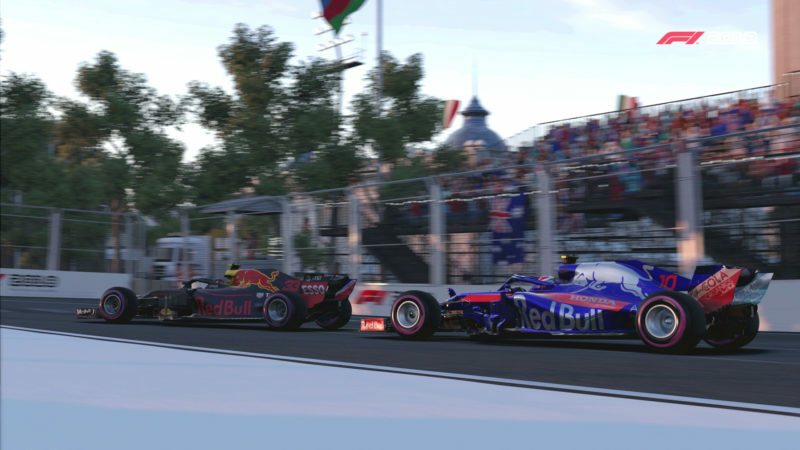 Codemasters has loosened the strings on the points purse, making it easier to amass them during any season. It makes the whole show feel less like a slog compared to ’17. What’s especially helpful with the training programs is the on-screen display. Take the tire wear program: a bar in the center of the screen shows tire degradation in real time. You can see in that very instance how your actions affect the rubber, and it makes learning what does and doesn’t work so much easier. All racing games with tire wear need something like this. In the tail end of the season, your engineering team will drop a bombshell. 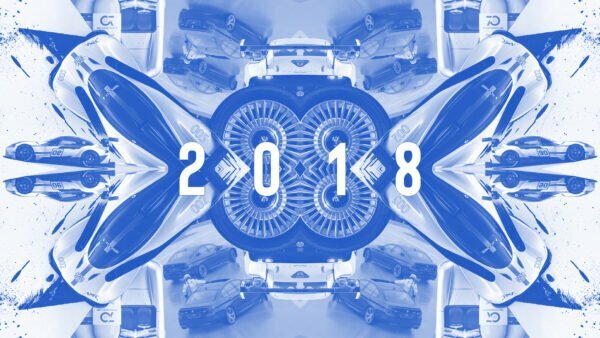 Year-on-year rule changes are a thing now, and it can mean all of your precious R&D advancements are rendered useless. I was worried about how Codies would implement this, but it’s quite natural. One of the four departments will be the target, and you need to spend 50% of the original upgrade price on each part to adapt it for the upcoming regulations. You won’t get bogged down in the minutiae of what the changes are; you just need to pony up some additional resources. Phew. Career Mode is utterly engrossing. 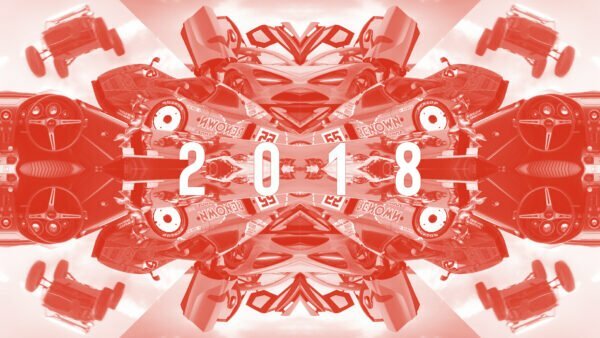 It’s the crown jewel of F1 2018, but if you find all of the off-track management daunting, you can do the entire 2018 calendar in the Championships mode too. But I urge you to take the plunge. 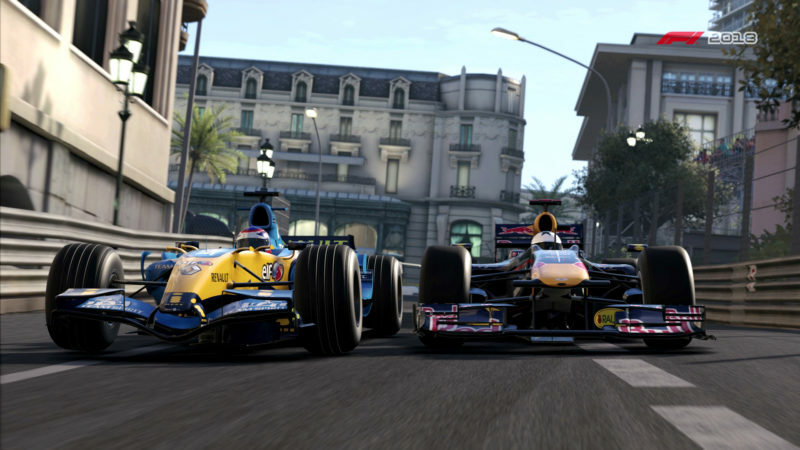 F1 2018 offers three main online modes. Time Trials are the usual approach with leaderboards for every track in the game. Expect a lot of Mercs and Ferraris here. Events are limited-time challenges that push you out of the hotlap mindset. The game will drop you into a specific race instance with a stated goal. Complete it and you’ll earn a points haul, based off multiple variables like AI difficulty, assists, and more. It introduces a lot more strategy into proceedings than the simple hotlapping of Time Trials. The first Event, which will be live for all players at launch, features Carlos Sainz at Spa. It’s an appropriate one given the circus is back in Belgium this coming weekend. When we interviewed Lee Mather last week, he specifically mentioned this event. 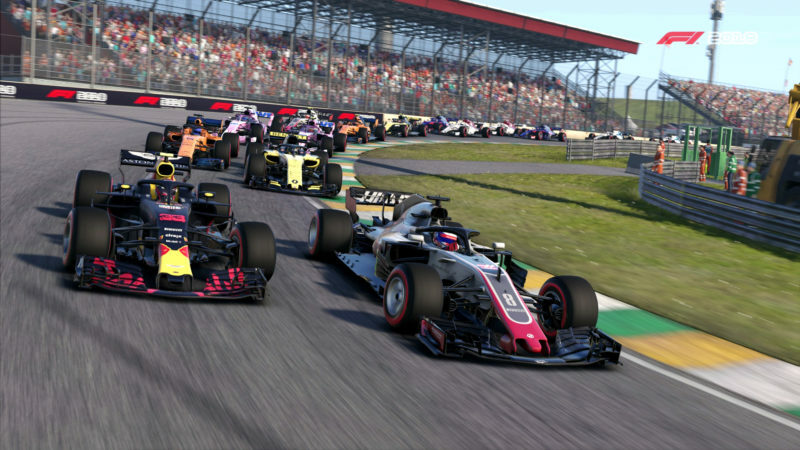 Without giving anything away, it’s a great challenge for those just starting out in F1 2018. Over in the dedicated Multiplayer section, there’s three options. Once again, players can create their own championships, allowing others to join in a multi-race series. Other players are free to join (if you want; it can be a private affair as well), be it as racers or spectators. You can create your own unranked or ranked matches as too. Wait, ranked? Yep, the big news for multiplayer is the addition of a ranking system. You’ll get your very own F1 Super License when you head into this section, which covers your Rank, Safety Rating, and Level. Racing in ranked sessions will improve your first stat, while keeping your nose out of trouble will help with the second. Meanwhile, the third is a progression stat; it’s XP, and you’ll move up the levels by racing in any sort of online match. Unfortunately, with this review taking place before the general release, there isn’t much to report on this feature. We’ll be keeping an eye on it during the early days and report back. You may not know this about me, but I’m not actually a Formula One driver. I don’t have experience behind the wheel of an F1 car — though I wouldn’t turn down the opportunity, even if I’m woefully under-qualified — so I can’t really judge if the on-limit behaviour of Hamilton’s weekend ride is 100% accurate. These are very powerful, very aerodynamic machines. But the improvements to this year’s tire simulation pulls off a magical double-act: it makes the cars more talkative while also making them more nuanced and thus, easier to drive hard. 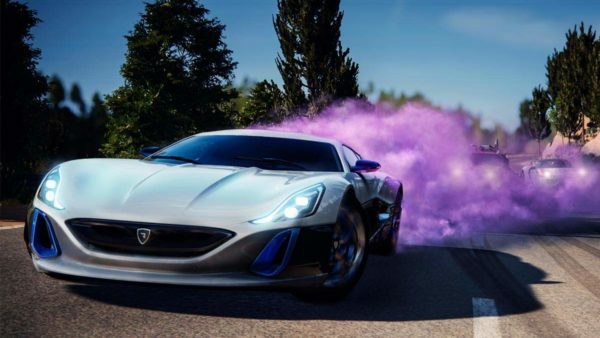 Make no mistake: if you push any of the modern cars too hard, they will bite. And once they’re past a certain angle — much less of one than you may be used to in other games — it’s beyond saving, and you best hope the nearest wall is lined with tires. But getting up to that point is much less of a guessing game in 2018. Each team’s steed is subtly different, but they all bite into corners with conviction. You can feel the grip peak and slowly bleed away if you come in too hot. Meanwhile there’s a huge swell of confidence from getting the nose tucked in early to slightly over-rotate, wind off lock with a generous opening of the throttle, and steer the car ever so slightly with the throttle. Rob Wilson would be proud. One of my main quibbles with last year’s title was the classic cars. All but the absolute newest felt like a boat in a storm sometimes, gently swaying to either side long after you’d straightened the wheel. They’re much more direct this year, though still miss out on the absolute initial turn-in bite of the modern cars. That’s as you’d expect, though: the F2004, the amazing beast that it is, has just a hint of hesitation on turn in. You feel the effects of those treaded tires, fighting past the faintest of sqidge before chomping down. I’m happy to report that this is a title that sits amongst the best in the field in terms of controller and wheel optimization. The default XB1 pad isn’t a poor relation; those rumbly triggers are fantastic, feeding plenty of info into your digits. 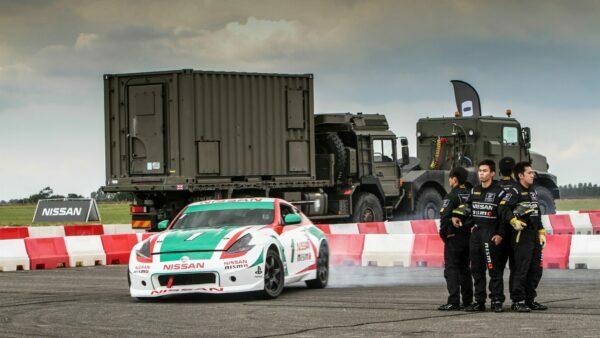 Whether you’re a tapper or a smooth stick operator, the cars behave as you expect. My wheel of choice for the review was the CSL Elite PS4. It provided a consistently strong level of feedback straight out of the box. F1 2018 provides one of the heavier helms I’ve driven lately, but I like a decent amount of weight to work against — it makes for a very precise drive. There was an issue with the wheel see-sawing on straights, but a quick dive into the Elite’s in-wheel tuning menu removed that. Braking, even with ABS off, is intuitive on the pad, and utterly engaging on the wheel. Once you’ve found the threshold, you can throw out the anchors at maximum effectiveness with pure confidence. If you’ve been sensing a trend of evolution over revolution so far, congrats. Just as other aspects of F1 2018 have come in for a few choice upgrades — or more appropriately, some new nodes from the R&D tree — Codies has given the visuals a subtle makeover. Overall, the whole package comes off looking more realistic than last year’s game. I briefly tried it on the regular XB1 and found it surprisingly consistent. The track-side objects, especially trees, look more natural. Look up to the sky and every track feels a little different, with more convincing cloud shapes mingling with jet trails. When the forecast goes south, the heavens look angry, and there’s a real sense of heft to those big grey storm clouds. Somewhat ironically, it’s when the rain starts coming down that F1 2018 really shines. It’s equal parts daunting and fascinating. Flying down the main straight at Suzuka in the middle of a storm, I feel claustrophobic — and not just because of the halo. The cars up front are kicking up a wall of mist, I can only make out their central lights, there’s small streams of water snaking across the tarmac, and the rain is pelting off the car’s carbon fiber nose. It looks awesome. Racing in sunnier climes ain’t bad either. The heat haze and mirage effect on the tarmac may both seem like small details, but they significantly add to the sense of realism, especially in replays. Seeing the whole grid take off from a standing start is like tuning into a Sunday race. All is not perfect, however. The character models still have a creepy, Uncanny Valley feel to them. Some are better than others, but my personal avatar looks out of place mingling with the likes of Vettel and Ricciardo on the podium. And while the rainy races are a sight to behold, there’s a lightning effect that discombobulates instead of immerses. It’s more like a strobe light. 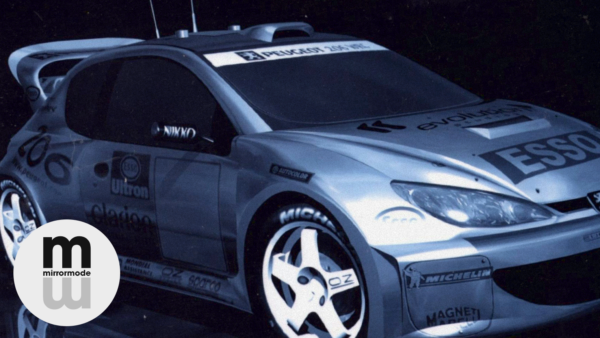 The frame rate, on either the vanilla One or the X, was almost always a consistent 60fps on-track, rain or shine. The only exception was the first sector of Canada: during my career race there (and only in that mode), I noticed significant frame rate dips running through the forested sections. I’m what you could charitably call a casual F1 fan. 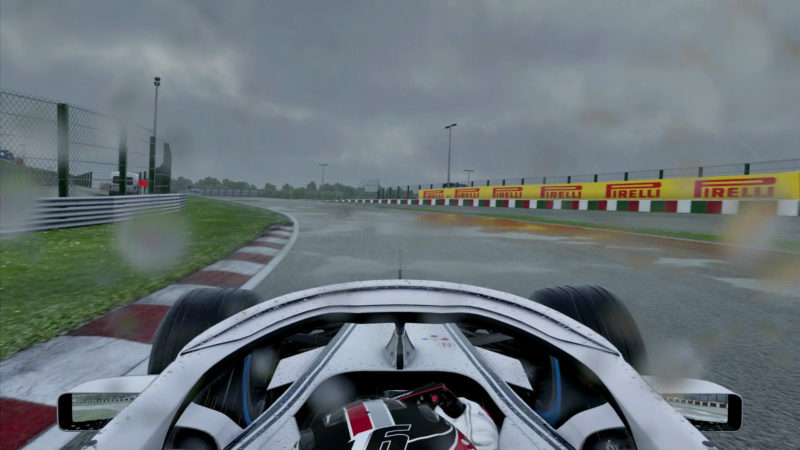 I don’t watch the sport as much as I’d like, and when I re-entered the Formula One gaming landscape last year with F1 2017, I was worried I’d drown in all of the techno-nerdery. But F1 2018 makes me want to watch more. Instead of being put off by a combination of singular focus and exceeding depth, I’ve found myself itching to explore every facet. You can wear many hats in this game: the obvious racer, sure; but also the engineer; the media-savvy frontman; the negotiator. 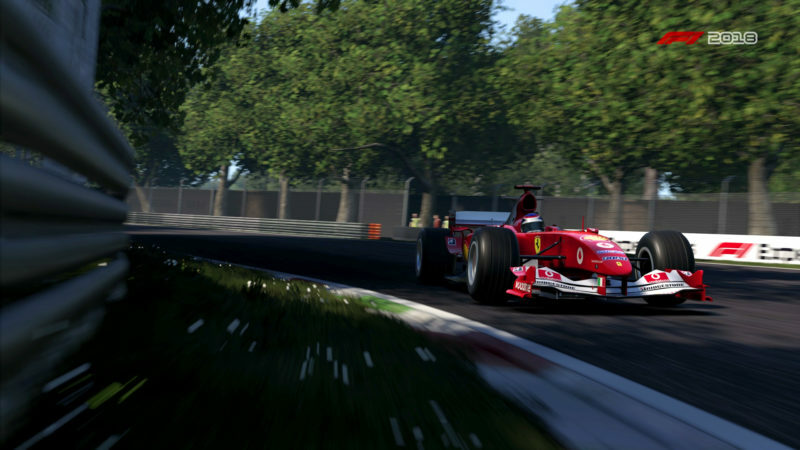 Codemasters has taken one of the most elite sports on Earth and made it accessible. 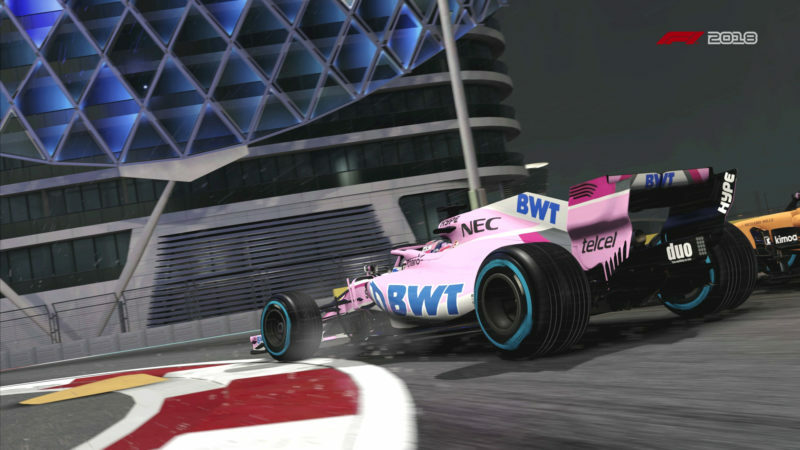 On-track, it strikes a balance that makes it approachable for beginners, yet demanding for experienced sim racers. A bevy of options and tutorials means players of all skill levels can find their own comfort zone. Off-track, it’s a racing RPG, introducing you to a team that genuinely feels like a cohesive unit, not an after-thought. You really can live the life of an F1 driver, dodging potential PR bombs in interviews the same way you dodge a poorly-timed dive up the inside at Hockenheim. Or, if you’d rather leave the engineering to the engineers, there’s the straight-forward Championships. 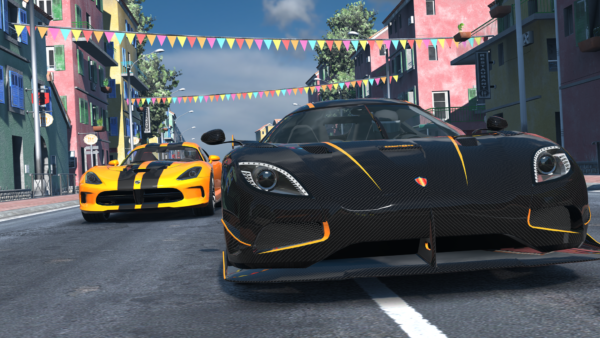 This is a very polished racing game that fans of the genre shouldn’t avoid. 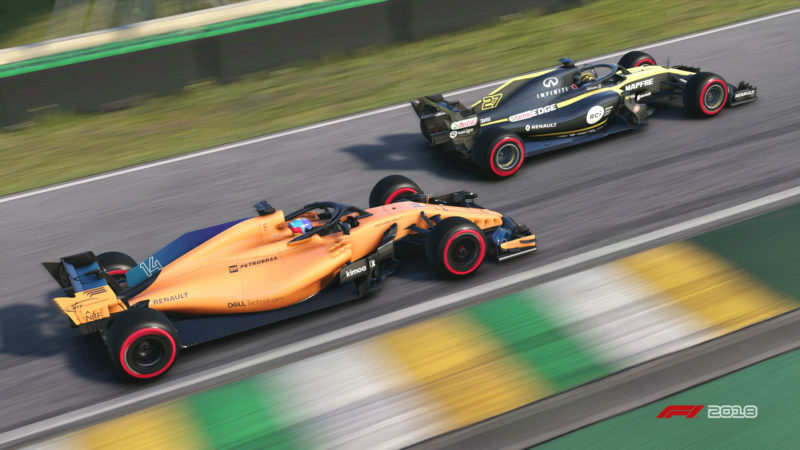 Even if you own last year’s title, F1 2018 offers significant improvements to warrant picking it up. Just make sure you listen to Jeff. The closest you'll get to living the F1 life without Mr. Ripley-ing one of the drivers. The full season, plus classics, plus the most engrossing career mode you can get in a racing game. 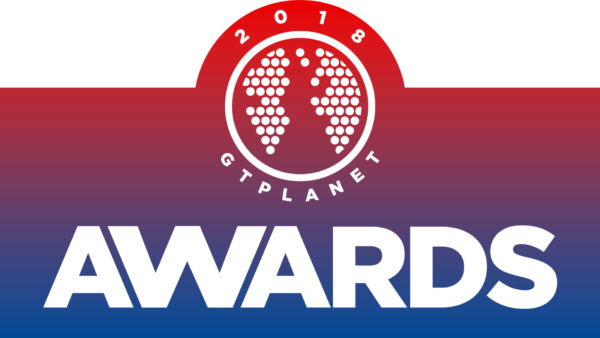 This year’s big new feature is a ranking system, a la iRacing and GT Sport. How will it play out in the hands of the public, though?. There’s a surprisingly deep engine here. Modern cars all have their own personalities, and classic cars really do highlight what the engine is capable of. A slight but thorough update to last year. Run them back-to-back and you’ll find ’18 is more natural — though character designs are still a little odd. Small but welcome differences amongst the modern cars and convincing atmospherics. But lordy, those V10 wails take the cake.